Acterna’s range of optical test kits. ACTERNA has announced two new additions to its range of easy-to-use optical test kits. The OMK-19c offers 'high power' testing up to +30dBm, and the OMK-9 delivers loss test at wavelengths 1310nm, 1550nm and 1625nm. The OMK-19c is suitable for installation and servicing of dense wavelength division multiplex (DWDM), CATV/multimedia and telecom systems. The OMK-9 is a complete solution for installers and service providers who need to measure the loss of single mode fibers at three wavelengths; to detect bending effects of installed fibres or before upgrading a fibre system to an L-band DWDM system, for example. 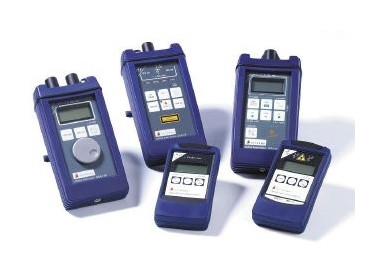 The three wavelengths kit OMK-9 includes a power meter and two laser sources, and OMK-19c comprises a power meter, laser source and optical attenuator. Both kits are conveniently packaged in a field-carrying case complete with adaptors, cables and accessories. The rugged, lightweight instruments are simple to operate and feature a range of automated functions designed to ensure efficient, reliable operation with no need for special training. All kit instruments feature low power consumption and may be operated with ac, dry or rechargeable AA batteries which can be changed in the field easily. The units are supplied in a sturdy housing - with splash-proof foil keypad and protectors for the optical connectors - to ensure reliable operation even in harsh field conditions. Both OMK kits can store data from up to 1000 tests, and come complete with Acterna's Optical Fibre Assistant software (OFS-300) - for presentation and analysis of test results.